A few years ago, the education secretary (at the time) Michael Gove said that the old GCSEs were just too easy (to be fair, I have never seen an old GCSE paper, so I can’t really say whether that’s true.) And so he changed everything, including the grading system. Now, like most of Michael Gove’s decisions, this one was very unpopular, especially with students (like me.) And the opposition is only getting higher, with nearly all teachers and students disliking the changes. And we haven’t even got to results day yet. But why did he do this? 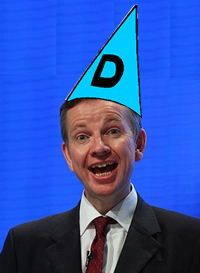 Why did Michael Gove change the GCSEs? I think the fact that I took a difficult and unpopular decision proves that I am a man of principle. He said this after pushing an old woman into traffic and saying that he was 100% committed to getting the old lady across the road, but realised he couldn’t so pushed her into the traffic.